At US Hole In One, we believe no perfect golf shot should go unrewarded. That is why our hole in one insurance packages are so popular amongst tournament sponsors and outing directors across the country. Securing prize coverage is as simple as choosing a prize, telling us the number of golfers at your event, and designating which par 3 hole you'll hold the contest on. We'll secure the coverage that day at a price that won't break your budget! Do your participants a favor and offer them incredible prizes with a hole in one prize package from US Hole In One. GM dealers receive discounted pricing when participating in our Authorized GM iMR Turnkey Program! 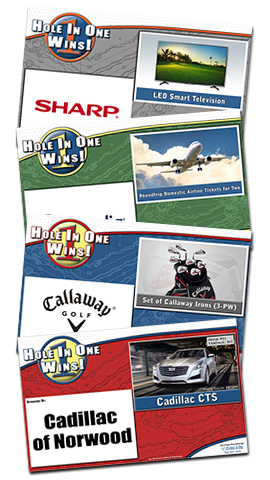 · "A" Rated Hole In One Insurance Protection - US Hole In One is Backed by the Best! · 110% Low-Price Guarantee - All Legitimate Hole In One Insurance Quotes Will Be Beaten! Using the price quote and purchase link provided by US Hole In One, complete the 7-section online application that was emailed to you with your hole-in-one insurance estimate. The purchase link can be found in the first paragraph of the body of the email. Once you open the link, you can view, edit and purchase the policy through the online application. Upon completing and submitting your online application, a certificate of participation and receipt/invoice will automatically be generated for you to print, email or download. Once the application is submitted, we will begin printing up your event signage. We will then ship you your signage via FedEx and email you a link containing tracking information. On the day of your event, place the signs out on the course. If a golfer successfully makes a hole in one, notify us via email within 24 hours, and we will promptly award the appropriate prize to the winner. Don't Forget About Our 110% Low-Price Guarantee! All pricing based on three factors: # of players, yardage of hole (min. 150), and grand prize value. All prices include grand prize coverage, bonus prize coverage, and signs. Above pricing based on all players being of amateur status and playing on 165 yard hole. Witness requirements may apply. Prices subject to change. Unsure about what grand prize to offer? Let our experienced tournament consultants help you out. They have put together the most extensive list of grand prize options available for hole-in-one insurance . We've got everything from vacations to electronics to championship sports tickets. Take a look today! Ask about our add-on contests too! When you purchase any hole in one prize package, you are eligible to receive an amazing discount on one of our putting contests. A great option for fundraising and charity events! Click below to learn more about this exciting offer from US Hole In One. Copyright © US Hole In One. All rights reserved. · What Is In a Prize Package? · What Is The Purchase Process?